Optional: Get $5 STORE CREDIT when you SHARE A PHOTO of yourself wearing your medical ID. You may show your face unless you prefer to be private. We will blur any medical issues or personal information engraved to protect your privacy. By submitting a photo, you give Elegant Medical Alert permission to share it in online marketing. Thank you for submitting your review. It will post within 24 hours. You have received an entry into our Product Review Contest. Good Luck! Measurements: 1 3/4 x 1 1/8 inches without the circular ring. The ring is 1 inch in diameter. 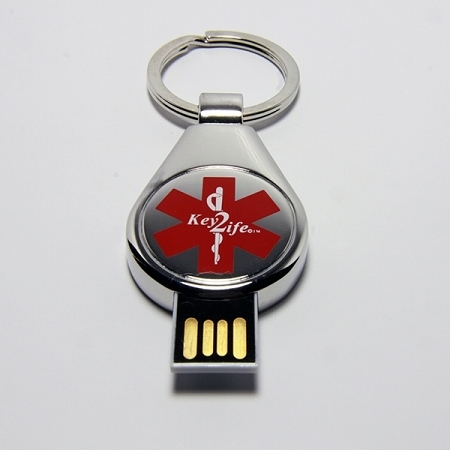 This Raindrop EMR Medi-Chip design contains a Key 2 Life® (EMR) with USB Medi-Chip. An individual utilizes this Raindrop EMR Medi-Chip to upload and store confidential electronic medical records. Access to confidential electronic medical records is urgent when a medical crisis arises. 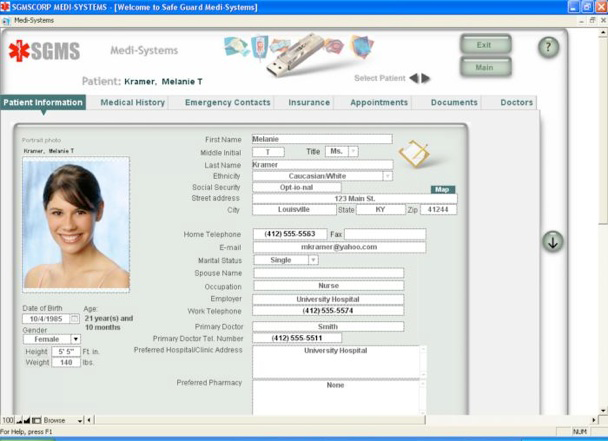 The Raindrop EMR Medi-Chip product separates to insert in a computer to acccess electronic medical records. 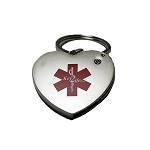 This Raindrop EMR Medi-Chip is light weight (3 ounces) and 100% waterproof. In addition to storing electronic medical records, there is sufficient data storage capacity to upload copies of legal documents, financial records, bank records, investment accounts, insurance policies, mortgages, vehicle registrations, and driver license for instant access of your other important documents and things in the event of an adverse environmental catastrophe, not limited to fire, flood, mudslide, hurricane, or tornado. Carrying your crucial documents in a highly-secure USB Medi-Chip on your person is a brilliant solution for domestic citizens and family members, including military personnel at home, at work, or at play. 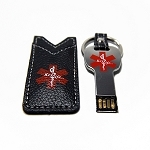 This Key 2 Life® (EMR) USB Medi-Chip is also a brilliant solution to be utilized by world travelers, cruise line passengers, and other vacationers visiting or relocating to foreign nations. Whether you are facing a spontaneous health crisis, environmental crisis, economic crisis, or societal unrest such as riots or terrorism, you will be prepared to instantly deal with any crisis that arises to overcome adversity in your life and the lives of your loved ones. To accomplish these results, simply wear or carry a Key 2 Life® (EMR) USB Medi-Chip. All Key 2 Life® (EMR) USP Medi-Chip products displayed on this website include the award-winning Medical Database And Patient Management software program. No coding, scripting, or programming is required. A 1-year warranty conveys to the original purchaser against manufacturer defects. In addition, if the original purchaser suffers buyer remorse during the 30-day period from date of purchase then there exists a “no questions” return policy. The “no questions” return policy requires the original purchaser to request a full-refund within 30 days of purchase and promptly return that Key 2 Life® (EMR) by shipping it back. An accidental damage warranty is now available at a rate of $18.00 per year from date of purchase. This $18.00 accidental damage offer can be paid for in full once per year on the renewal date each successive year from the date of purchase. Alternatively, this accidental damage warranty can be paid twice per year, by making two incremental payments of $9.00 each six months totaling $18.00 under a split-payment offer. 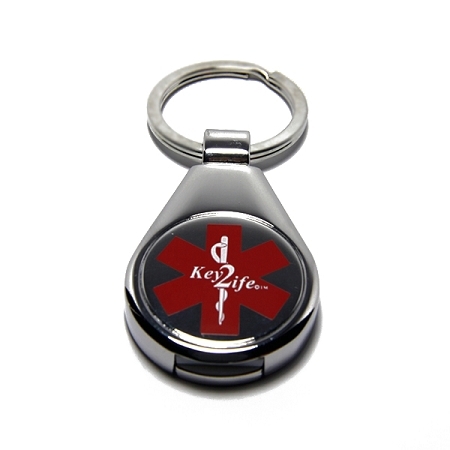 Theft or accidental loss of the Key2Life® (EMR) is covered as is accidental physical damage, accidental water-damage, and the wearing off of the crucial medical symbol. Accidental dropping of the Key 2 Life® (EMR) which results in breakage is also covered. This warranty offer to cover theft, accidental loss, and accidental damage does not cover intentional or reckless conduct by you or by persons acting in your stead. Warranty does not extend to matters of cosmetic scratch or cosmetic imperfection that occur as a result of reasonable use.